Not only are storm doors great for adding an extra layer of security to your home’s entryway, but they can also prolong the life of your main exterior door by shielding it from harsh weather conditions such as rain, ice, and snow. The home improvement professionals at West Shore Home can outfit your home with a beautiful and durable storm door made by industry leader ProVia. 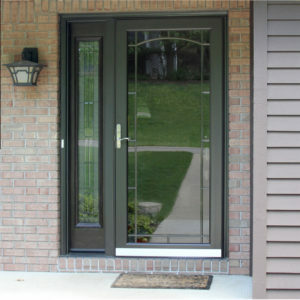 With retractable screens and decorative glass options to choose from, you can design a storm door that looks great and serves as a functional component to your entryway, allowing sunlight to get inside but keeping out pesky insects. With more than 50 different models of durable aluminum storm doors to choose from, you will be sure to find a storm door that meets your style preferences and beautifully complements your home. Our highly trained technicians will complete the installation in a timely manner, treating your home with the care and respect it deserves and minimizing any disruption to your daily routine. What’s more, with our zero risk assurance, you won’t have to pay a cent until your new storm door is installed and you are completely satisfied with the work we’ve done. How’s that for a guarantee? For more information about partnering with West Shore Home to have one of our top-of-the-line storm doors installed, contact us today. We proudly serve the cities and surrounding areas of Pittsburgh, Harrisburg, Lancaster, and Tampa.